In order for a wine to be called Champagne it must come from Champagne, France. All other sparkling wines world wide may not be called Champagne technically…although many people make that mistake on a regular basis. Champagne located north of Burgundy and East of Alsace. Champagne is typically made with a blend of Chardonnay and Pinot Noir grapes. You might be wondering how they make white wine with a red wine grape but the secret is how they press the grapes. They press them gently and separate the juice from the skins during fermentation therefore yielding a white wine. There are other varietals allowed in Champagne but they are rarely used: Arbanne, Petit Meslier, Pinot Blanc, Pinot Gris, and Pinot Meunier. Some versions of Champagne are made entirely from one grape or another. Blanc de Noirs refers to wine made from red grapes (Pinot Noir or Pinot Meunier) while Blanc de Blanc refers to wines made from 100% Chardonnay. Rose Champagne is made by either a) allowing skin contact during fermentation or b) simply adding still (non-sparkling) Pinot Noir to the mixture. In fact Champagne is one of the only regions that allows Rose production by addition of wine and not skin contact. This leads to another important fact about Champagne: There aren’t vintages on the bottles. Almost all Champagne is produced by mixing grapes from various vintages. Producers are more concerned with consistency rather than having a unique wine from year to year. This is one of the reasons they may add still Pinot Noir to produce Rose rather than gamble with skin exposure as that may come out different year to year. There are exceptions to this rule though and every so often there is a spectacular vintage a Millesime is declared and producers will bottle and label their wines with only grapes from that vintage. These wines are expected to be of higher quality and warrant cellaring where regular Champagne is meant to be consumed immediately. The most common variety you’ll find on the shelf is Brut. Also important is that many producers are known for making different styles ranging from light to medium to full bodied wines. Unfortunately the only way to know what you’re buying is to learn the producers or ask for help at the store. Lastly, let’s talk about how to properly open a bottle of Champagne. We always see in the movies or on TV people popping open the bottle, cork goes flying, and fizz erupting from the bottle. That’s not how you do it….all that fizz/foam is wasted bubbles and wine! Here’s how to do it properly: First step is to remove enough of the foil to expose the wire net. Carefully remove the wire while maintaining pressure on the cork. While holding the cork rotate the bottle in your hand at an angle to gently ease out the cork. While it may not be as glamorous and fun…this will prevent cork missiles, flat, and wasted wine. Champagne is meant to be served chilled just like other white wines. The classic method is an ice bath of 50% mix of ice/water for 20-30 minutes. However here at the Grape household we like to get creative sometimes. 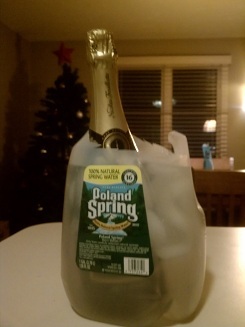 Since we don’t drink Champagne often we don’t have an ice bucket so I made my own while Moby was still at work. I took a gallon water contained, cut off the top, and voila…instant ice bucket. colonelgrape: 81. I’m not a huge Champagne fan, most bottles just don’t do it for me. It has 2 strikes against it before I even open a bottle: I don’t like Chardonnay or carbonated beverages too much. That being said I can appreciate a good bottle when I taste one and nothing says celebration like Champagne. This bottle was definitely on the dry side of Brut but it was still fun. Moby definitely enjoys her bubbly more than I do but for New Year’s, a wedding, a Birthday, or a major accomplishment no drink does it better. 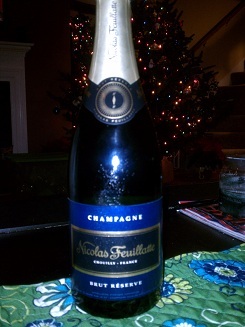 If you’re looking for a light-medium body Brut Champagne you’ll do well with this $35 Nicolas Feuillatte. Personally I think I’d be happier with a dry or demi-sec to cut the Chardonnay flavor a bit. MobyGrape: 80. I’ll be the first to admit, I do enjoy a nice glass of the bubbly. There’s just something about drinking a glass of champagne (or sparkling wine, if you’re a snob like the Colonel) that makes you feel happy and fancy. Even if you’re drinking it while in your pajamas eating pizza, (not that I’ve ever done that) you feel like you’re a Bond girl. This was definitely a drier champagne which isn’t really my style, however it didn’t stop me from drinking 3/4 of the bottle because it still had a nice flavor. If you want something sweeter though, steer clear. Happy new year to me! This entry was posted in Champagne, Chardonnay, France, Pinot Noir, Sparkling on January 3, 2013 by colonelgrape.